Digital Stream to launch Freeview HD recorders | What Hi-Fi? Due to go on sale at the end of April/May, the models range in price from £180 to £290. 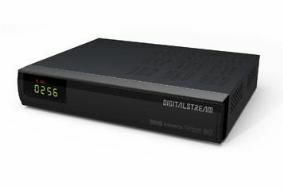 Digital Stream DHP-8100U (£180): Freeview HD set-top box with USB record function. Available end-May. Digital Stream DHR-8202U (£250): Freeview HD PVR (personal video recorder) with 250GB hard drive. Available end-May. Digital Stream DHR-8203U (£270): Freeview HD PVR with 320GB hard drive. Available end-April. Digital Stream DHR-8205U (£290): Freeview HD PVR with 500GB hard drive. Available end-April. Digital Stream says it's the first company "to pass the very difficult DTG (Digital TV Group) certification" and claims it will be first to market with a Freeview+ HD product. Humax has already launched its own Freesat HD receiver, the Humax HD-FOX T2, but it has no recording capability. Several other manufacturers, including 3view, Philips, Sharp, Toshiba and Sagemcom have also announced plans to launch Freeview HD PVRs in the UK, although these are not on sale yet. Initially the Digital Stream boxes will be available from John Lewis, Maplin, Currys, Amazon and Comet. All models will be upgradeable to the Onyx website browser during the second half of 2010 via USB from the Digital Stream website. This will enable use of catch-up TV services from the BBC, Sky, ITV, C4, Five and other broadcasters in the future. The boxes will incorporate YouTube, Facebook and Twitter widgets for accessing social networking sites on a TV. As well as developing a range of Freeview HD boxes, the company has also created a simple IPTV (internet protocol TV) box that plugs into a television set to give access to the internet. It will work with the BBC iPlayer, Sky Player, YouTube, Bollywood video-on-demand, Facebook and BetFair. The Digital Stream IPTV set-top box will cost between £75 and £79, and is fitted with Scart, HDMI, Ethernet and two USB sockets. For more information on the launch of Freeview HD, and related hardware, see our News story.